Police officers in the West Midlands are making use of the vantage point provided by local double-decker buses to detect drivers using a mobile phone at the wheel. Operation Top Deck has been launched by the force’s Road Harm Reduction Team and sees plain clothes officers equipped with video cameras peering down at passing motorists. Information is radioed to police motorcyclists who divert offenders to a designated site where they are given an ‘educational input’, including a ‘hard-hitting’ virtual-reality video highlighting the potentially devastating consequences of using a phone while driving. 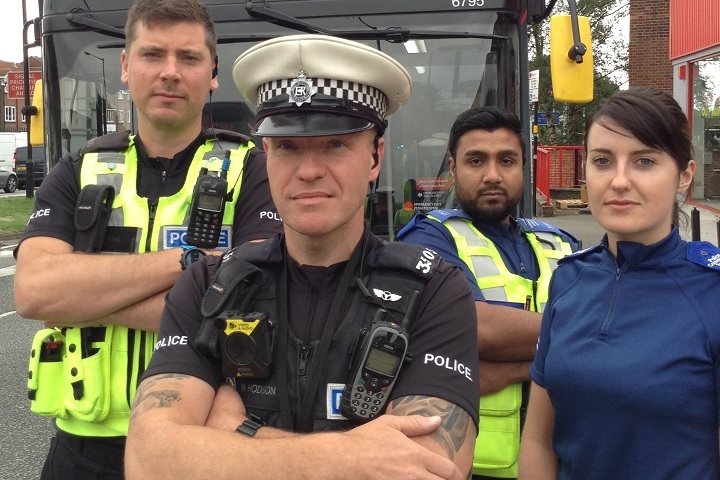 Bus passengers can also support Operation Top Deck – a joint project with National Express and Transport for West Midlands – by supplying their own video evidence via a dedicated self-reporting facility on the West Midlands Police website. The operation has been described as the first of its kind in the UK and follows other initiatives introduced by West Midlands Police – including Operation Close Pass, which involves plain clothed police officers saddling up to look for motorists who do not leave the required space when passing cyclists. 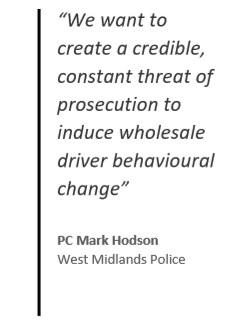 PC Mark Hodson, West Midlands Police, said: “Using mobile phones while driving is proven to be as dangerous as drink driving; it can devastate lives and people need to understand this isn’t acceptable. “We want to create a credible, constant threat of prosecution to induce wholesale driver behavioural change and make our roads safer. “The buses are ‘borrowed’ from National Express and will look like any other bus in service – but they will be driven by safer travel officers who are qualified bus drivers and the passengers will be police officers or PSCOs equipped with video cameras. The first operation took place on 17 September on the A34 Birmingham Road and saw 45 motorists caught using phones. 13 of them – who were using devices in stationary traffic – were given on-the-spot education about the dangers. These drivers face prosecution should they be caught a second time. The remaining 32 drivers face the prospect of a £200 fine and six licence points added to their licence. One man was caught using his phone while on route to a speed awareness course, while a female driver was prosecuted for driving without due care and attention after officers found her eating from a bowl of cereal in her lap. At least, given enough continuance and publicity it may send out a message that you could get caught and perhaps prosecuted. It could help act as a deterrent. That said and as I have mentioned before it only needs a police officer or a PSO in or out of uniform to take up a position close to any junction and take videos or pictures of offenders and they will catch a fair share of offenders every day. Hats-off to the police for coming up with this – although having gone to all that trouble, is simply providing an ‘educational input’ rather than prosecution, a bit of a let off?